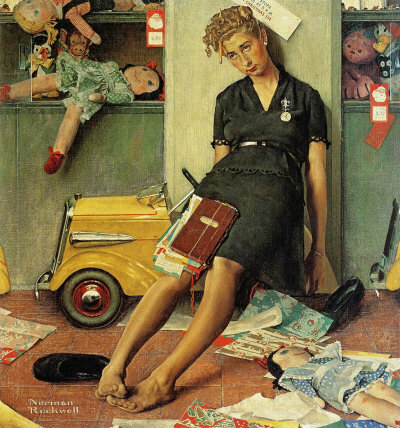 This Norman Rockwell Christmas painting, Tired Salesgirl on Christmas Eve, appeared on the cover of The Saturday Evening Post published December 27, 1947. This remains a timeless favorite of all Rockwell collectors, no matter what their age. An alternate title for this painting is Christmas Rush. The original oil on canvas, 30.25 x 28 inches or 77 x 71 cm, is housed in a private collection. This Norman Rockwell Christmas painting was the 250th overall out of 322 total published Norman Rockwell Saturday Evening Post cover. Rockwell's career with the Post spanned 47 years, from his first cover illustration, Boy With Baby Carriage in 1916 to his last, Portrait of John F. Kennedy, in 1963.
on page 176 of Norman Rockwell, A Definitive Catalogue by Laurie Norton Moffatt. And to think it only cost fifteen cents brand new! This painting illustrates what a master storyteller Norman Rockwell was. The date is Christmas Eve, and the time is five minutes past five o'clock. This sales clerk has never been so glad to see five o'clock come before. The sign above her head informs us and any customers that store closes at Five O'clock on Christmas Eve. The small clock on her lapel pin informs us that the time is five minutes past closing time. The customers are gone and she has slumped against the wall with her bottom resting on one of the toy cars that did not sell and are still parked along the wall. She has kicked off her shoes (long overdue!) and is rubbing her feet and toes together, trying to make them feel better. Her hairdo only droops a bit. And she seems blissfully oblivious to the chaos left behind in the toy department around her. She has not reconciled her sales book yet, and truthfully that seems to be the least of her concerns now that she finally gets a break. Tired Salesgirl on Christmas Eve was only one of 322 Norman Rockwell Saturday Evening Post covers; Here is the list of Norman Rockwell Saturday Evening Post cover illustrations. She is in no hurry to pick up the wrapping paper or the doll that is lying on the floor. She does not even notice that the toys on the right hand side of the painting seem to be gawking at her. The price tags that are visible are also a point of interest. Ah, to be able to buy a nice, well-made toy for only $2.98! Those were the days. Do You Have A Great Story, Opinion Or Contribution About Tired Salesgirl on Christmas Eve?